How many FHA loan options to build or buy are out there for those who need a new home? The number and type of options may surprise you. FHA home loans can be used to buy condo units, mobile/manufactured homes, existing construction properties and also new construction. June 6, 2018 - How many FHA loan options to build or buy are out there for those who need a new home? The number and type of options may surprise you. FHA home loans can be used to buy condo units, mobile/manufactured homes, existing construction properties and also new construction. FHA home loans are available for 1-4 unit existing construction homes in a variety of ways. You can purchase with an FHA 203(b) mortgage (the “typical” FHA forward mortgage loan to buy a house), but you can also buy one with an FHA 203(k) rehab loan for fixer-uppers. Fixer-upper loans will require the borrower to use escrow, and generally do not permit the borrower to get cash back on the loan except for legitimate refunds of money paid up front and later financed into the loan. Borrowers can also refinance a non-FHA mortgage into an FHA home loan with potentially better interest rates (your credit qualifications will help determine this), and options such as added funds for energy-saving improvements as part of an FHA Energy Efficient Mortgage. Participating lenders who offer FHA guaranteed mortgages may choose to offer FHA loans to purchase mobile homes, modular homes, or manufactured housing. Not all FHA lenders choose to do this, but for those who do the borrower has another option to consider. Your housing market, overall demand for this type of loan product, and other factors may play a role in whether such loans are available in your location. 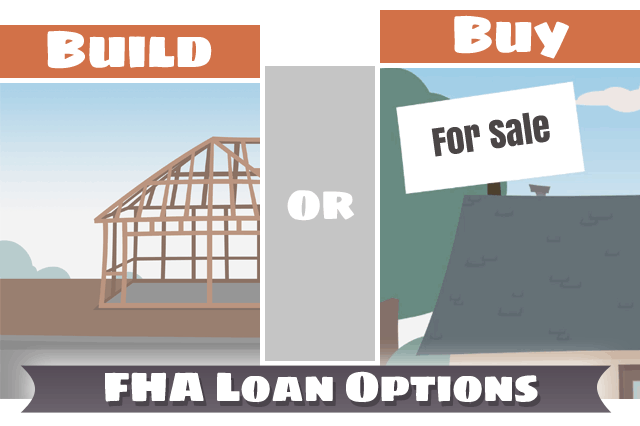 FHA loan options include One-Time Close construction loans, also known as construction-to-permanent mortgages. These loans can be more complex that existing construction mortgages, but well worth the effort for those who want just the right kind of home design, size, and location. One-Time Close loans are available as FHA mortgages, but also via the VA home loan benefit program and even as a USDA loan. A VA One-Time Close construction loan may feature added benefits for qualifying service members such as zero down payment options, streamline refinancing for later in the lifetime of the loan, and more. As your participating lender about One-Time Close construction loan options including VA, FHA, and USDA versions of the program. You’ll be pleased at the range of options open including the potential to buy land to build on as well as funding the construction itself, depending on the transaction and other factors.